April 20, 2006 | SMITHFIELD -- After 25 years as an engineer, a life in the floral business might seem an odd choice, but that's exactly what Richard Hansen, 60, chose when he opened Every Bloomin' Thing. Hansen said his love of flowers goes back to the 1960s when his father-in-law owned 12 acres of peonies that were sold for Memorial Day. "We sold what amounts to $150,000 of peonies in today's dollars. That whet my appetite for peonies," Hansen said. After working in civil engineering at Hill Air Force Base, Hansen spent 12 years in property restoration and renting out property. The whole time, he kept an ever-increasing patch of peonies. Eventually, his garden was large enough to sell peonies to wholesalers. Hansen's passion for flowers soon turned from a hobby into an occupation as he began to buy flowers from other growers and finally opened his own store. Hansen said getting the building he works out of was a scary experience for him. "I was scared to death of the owner Ralph Roylance. I don't know how I did it, but I finally worked up the courage to go see him and tell him I'd like to buy the building," Hansen said. "We talked about it and did the deal on a handshake; that's something you never see anymore." Every Bloomin' Thing is in a building rich with Smithfield history. 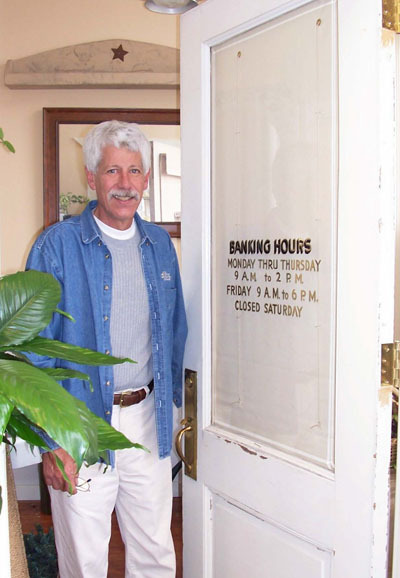 Its current location at 98 North Main Street is a 100-year-old bank building. "We had to put $20,000 into it to bring the building up to code. We had to rewire, replumb, and we're just getting the handicap access put in," Hansen said. Hansen said he thinks the renovations are worth the money so that the building stays true to its history. "Besides that, my senior thesis as an engineering student involved interviewing building owners to see why it made economic sense to restore building. I decided to put my money where my mouth was, and restored this building." Hansen has stripped the floors down to their original wood, revealing rich browns in some spots and worn grays, where he said the tellers stood in the building's bank days. One spot on the floor remains covered in a large area rug, because it is a large cement block that covers the area where the old boiler still stands. While Hansen said the boiler isn't in use anymore, he says the bank put the cement there to protect people just in case it blew up one day. He also restored the walls to the original blond brick, making it possible to see the part of the wall where the building was expanded as bank business grew. As people approach the store, the word "BANK" over the door still greets customers. Hansen even found the original bank door and put it on the bathroom. The largest floral cooler in the valley comes as a benefit of a renovated bank vault, Hansen said. He said he had to put on some insulation, but that the room was perfect for his flowers. The basement, now a storage room for seasonal gifts and dried flowers, still bears the mark of its bank days, with paper storage shelves labeled with years and towns. An office in progress was once the coal room, and the out-of-use boiler sits in the next room, a hulking relic of bygone days. The rewards are not just in seeing the beauty and history of the building, but also in hearing peoples' memories of the place, Hansen said. "We still have people come in that remember this building as a bank. They'll reminisce about a loan they took out or coming in with their parents when they were younger." 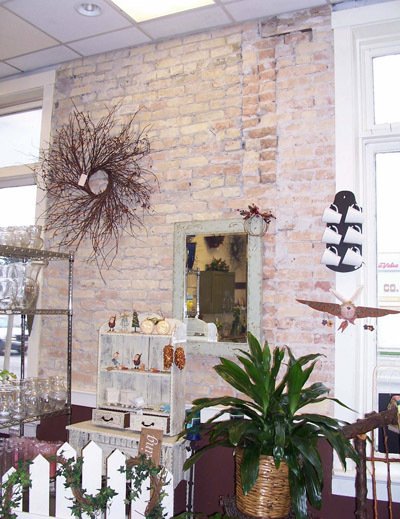 The shop is inviting; the smell of flowers and scented candles greets the nose, while an assortment of gifts and flower arrangements greet the eye. A cooler in the corner bears the motto "In trouble? In love? Send flowers!" Hansen said there will be people who come in and walk straight to the cooler. Hansen's generosity is evident is the stories he tells, and the care he invests in his customers. "The people coming in and saying they liked their flowers or telling me about their lives, that's the gratifying part," Hansen said. "The van breaking down, that's the miserable part." Billing, tax returns, automobile repairs, government paperwork, new competition and marketing have caused problems for Hansen. "That's the kind of stuff that drives you nuts. I believe the best businesses will survive, but it's still a tough thing," Hansen said. But he said he was kept the business going because the quality of his products is high and his personnel are knowledgeable. Every Bloomin' Thing is open from 9 a.m. to 5 p.m. Monday through Friday and 9 a.m. to 4 p.m. on Saturday.